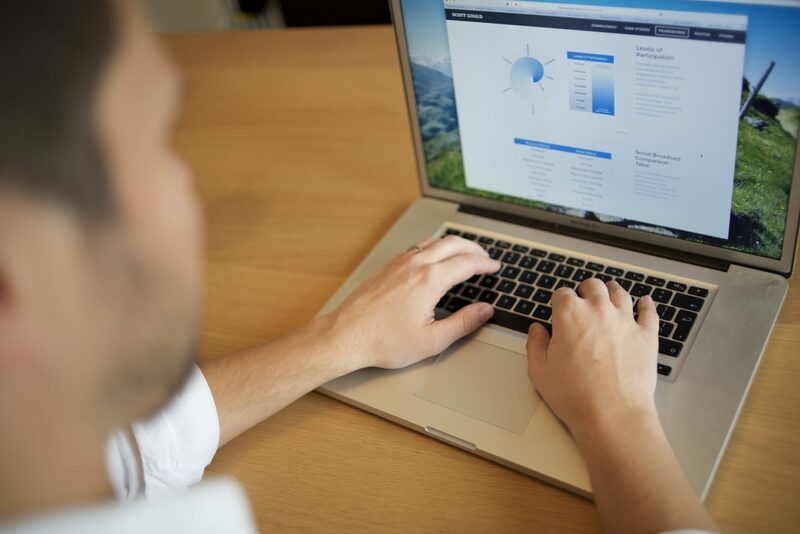 In this article we will briefly look at the current state of webinars before we analyse a webinar run by HMRC (the UK tax office), and how you can replicate that on your own webinars. We’ve all been on more webinars that we can remember, yet few of them were probably memorable. That’s because the format that most webinars run by is truly horrid. 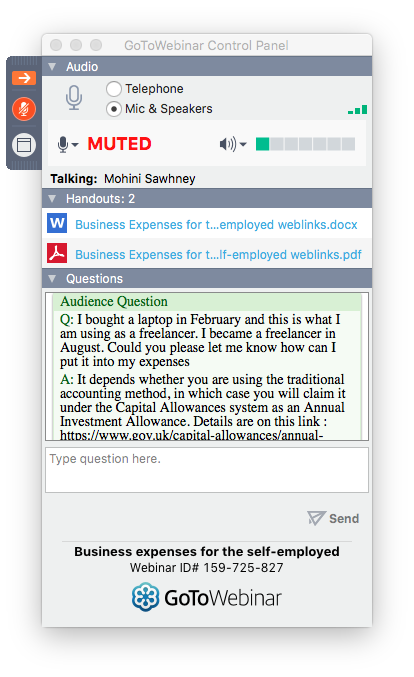 But in a recent experience that I had, I have discovered you can learn a good deal about running a highly engaging webinar from HMRC. First of all, why are webinars so horrid? A webinar is almost always a broadcast / broadcast environment, where we simply listen as people go through slides, rarely turn out to be one of the lucky ones who gets their questions answers in the Q&A (that is, if we stayed onto the webinar until then), and then find out in the end that we could’ve just had the recording emailed to us. They are also just as horrid for the organiser. Anyone who has run a webinar knows how hard it is to get signups, and then the ones who do signup don’t pitch, or don’t stay for long throughout the webinar, and then at the end you send out the video and slides into the ether, and you rarely hear anything back. Encouragingly, yes! 5 of them in fact! Probably the main criticism of webinars is that they are boring. Drill into that a bit deeper, and the reason is that a webinar is normally run by one or two speakers who vary their content very little, e.g., speaker 1 does his introduction, speaker 2 does her expert piece, and then speaker 1 takes questions and wraps it up. Then the host would conduct a poll for people to test their knowledge, and clarify any confusion as a result of the poll (see later). Then repeat for the next section in the webinar schedule, the whole thing being 45 minutes or so. The reason why having varied content worked is that it keeps people engaged. Before their attention slips off on a topic, the webinar changes pace. What was particularly good was the two different accents, who had different tones and spoke with different paces. When the host spoke, it was slow and warming, like a mother’s voice. Her contribution was to ensure everyone was on the same page. Then, when the expert spoke, she spoke a bit faster (not too fast, just a bit faster), and had less of a warm voice, and more of a directive voice. Her contribution was to provide the knowledge. 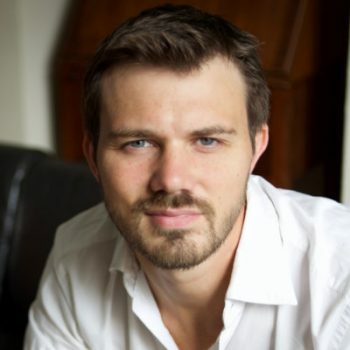 Takeaway: vary your webinar content! Vary the presenters, the pace, the voices, the accents, etc. It isn’t hard, it just requires some preparation, rather than dusting off last month’s slides and using those again. 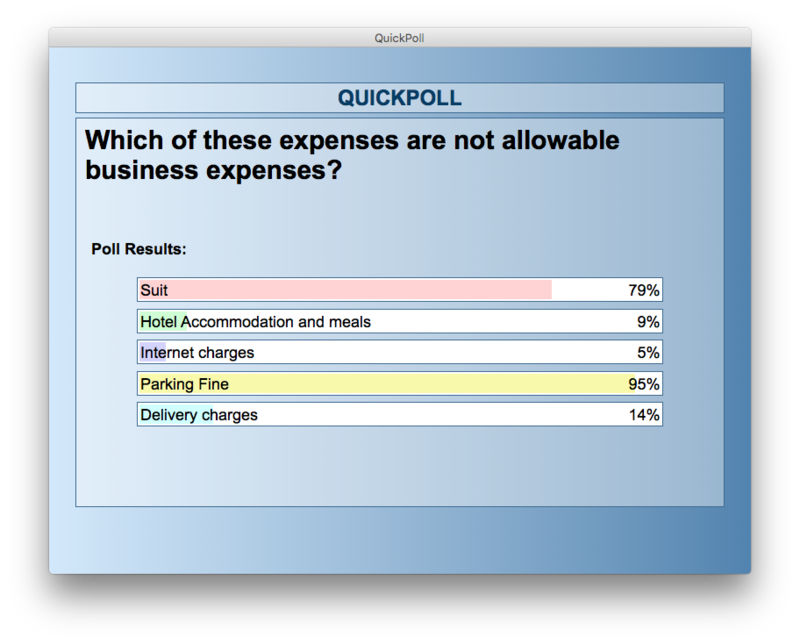 Polls are an easy feature for webinars. Yet few webinars use them. 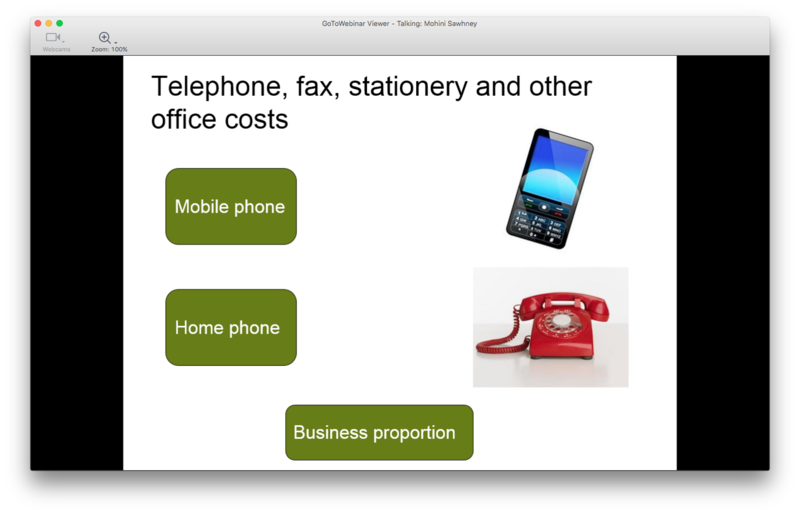 The HMRC webinar used them after each expert section for people to test their knowledge. It enabled people to LEARN! We learn by what we do more than what we hear. By applying knowledge direct after learning it, the knowledge sticks. Seeing the poll results enabled the organisers to see if people understood the section, and then they could address any lack of clarity straight away. Takeaway: provide direct learning application and feedback through a poll, and then address any lack of clarity. During the expert sections, the speaker had very simple slides, many of which referred to the HMRC tax return process. This meant that when it came to people filing their taxes, they had already seen the slide in the webinar, and thus had been primed on how to fill it in. Filing your taxes can be a unnerving experience because of its technical nature and financial language. 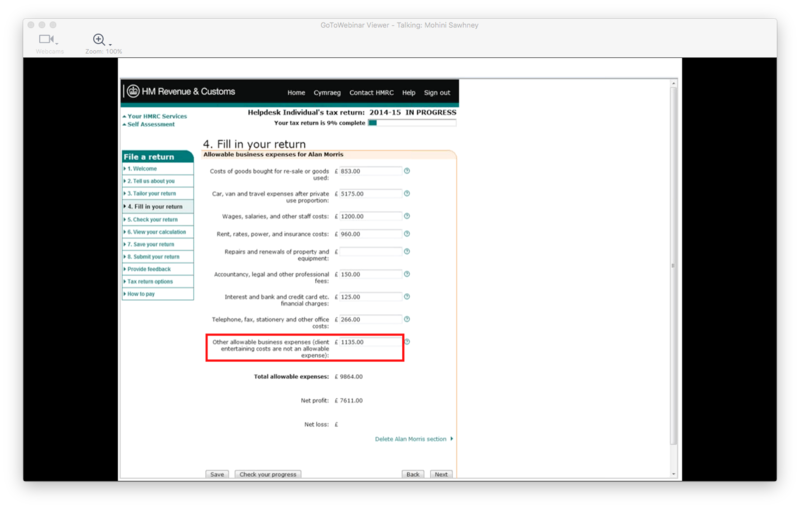 These slides prepared people, and thus gave them confidence to go through the procedure (which helps both the self employed person, and the HMRC, who have fewer late or inaccurate returns to follow up). Takeaway: have content in the webinar that will help people the moment they leave by showing them exactly what to do. No doubt during the webinar, despite how engaging the above items were, some people would get bored because their specific questions weren’t being asked. You don’t have to wait till the end to find your question won’t be answered, like you have to in most webinars! This was, in my opinion, a simple stroke of genius. They had a small number of people answering the questions, so the flow kept going throughout the entire webinar. The host would constantly remind people they could use the chat (for those who arrived late), and occasionally share a question and answer that was particularly pertinent. Takeaway: answer questions the whole time, and point to that feature. Use this information to help you understand what you audience really want to know, to help you better frame future subjects. Finally, the webinar provided lasting benefit. By attending you came away with knowledge that you could use. What HMRC have done is go from being the big, faceless organisation that takes your hard earned cash to becoming the organisation that empowers you to take charge of your finances. That’s platform strategy. That’s engagement as empowerment. Takeaway: run practical webinars that increase your audience’s capacity. You can tell I was throughly enthused by my experience on this webinar. I hope that you too can go away and use these tactics to make your own webinars far more engaging. To create engaging webinars mixup the content, vary the tempo, and focus on people's learning over their listening. I think that if we can create truly engaging webinars we can really empower people, and that’s the kind of webinar I’d want to attend, not just signup for and then never pitch.